Thanks to Scott, Megan and Ethan...This is the other man in my life-and Blueberry is his name. I love my beta fish. I'm worried however, about his scarce eating habits. Blueberry (or Banana as some would call him) is a nice friend to have around-especially when I just want peace and quiet. He loves the color yellow and will follow it if put in front of him. I love when he flares out. 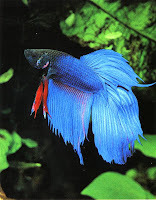 Beta fish flare or "puff out" sometimes, and they are beautiful! Usually, however, they only do this to impress or intimidate other fish. A good way to trick the fish is to put a mirror in front of him and let him see his own reflection- I've been thinking about getting a tank and purchasing some other types of fish-I think this would be good in my loft-while my dog will have to wait until I get a home.